DANIEL PIPES SPEAKING AT UNIVERSITY OF CALIFORNIA-IRVINE: ... a war, of lots of despair. 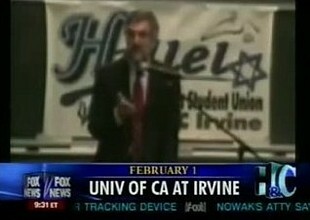 HANNITY: That was the scene at U.C.-Irvine last Thursday when Muslim protesters disrupted a speech entitled "The Threat to Israel's Existence," by Daniel Pipes, the director of the Middle East Forum. Instead of engaging in debate, the demonstrators continued their protests outside. The university had this to say about the event. The disruption lasted about two minutes, extended somewhat by other audience members voicing their support for Mr. Pipes. There were no further interruptions and afterward, the hosts of the event went before the audience and thanked the university's police for its assistance on what the organizers would characterize as a successful event. Daniel Pipes joins us now. First of all, there is a real threat to Israel's existence. Anybody that cares about safety and security of people in the region and the State of Israel has got to recognize that's true. What were they saying when they disrupted you? PIPES: As they left the hall they said, "Anti-Israel," "Anti-occupation," "Anti-oppression," "Anti-hate," "Anti-Israel, Anti-Israel." But what's more interesting is what they said after they left the hall. Now, I didn't see this myself, I stayed in the hall. But one of the participants went outside and recorded what was said outside. And there's a transcript of it. Let me read you just a couple of excerpts. Just keep on doing what we're doing. Our weapon, our jihad, our way of struggling in this country is with our tongues. We speak out … and this is the best we can do right now. And our brothers and sisters on the other side of the world, they're handling business in their own way. May Allah give them strength. In other words, we're just using our words now because we can't engage in violence here, but let's wait until the day that we can. The university, as you just read out, said this is fine. This is a successful event. There are no problems. I can't imagine. HANNITY: Daniel, based on the transcript as you're reading it to us, I'll tell you, my biggest concern is there are people that think this way in this country and have that mindset and that mentality. That is a threat to all of us. Just listening to their rhetoric, that's the scary part, isn't it? Don't you think this is somebody—if that tape exists as you're reading that transcript, isn't that somebody that the FBI would maybe want to talk to? PIPES: I would think so. There are two problems here. One is that someone will be saying this and no one cares. And the other is that my talk was disrupted and the university is just fine with it, has no problems. They played by the rules. They left. And the university just, you know—just says it's fine. HANNITY: But Daniel, look, you know it's par for the course. If you're a conservative, if you have different points of view, this is going to happen. PIPES: It is. It's happened to me before. Number of institutions. And the universities in the other cases also said, "Just fine." PIPES: But you know, the university is supposed to be a place for the free exchange of ideas, but yet what we're finding is it's the place with the least. COLMES: Hey, Daniel, it's Alan. You were invited to what you're calling a liberal university. And you did speak. And as I understand it after they disrupted the event, something I wish they had handled in the Q& A period. I wish they had challenged you there. But they left and then you got a chance, as I understand it, to finish with your presentation, including the Q & A period. Is that correct? COLMES: So your point is not that you couldn't be heard? PIPES: No, I was not. And I'm not complaining about that. I'm complaining that the university has no problem with what happened, as you can see from the press release that they issued today. No problem. It was a good event. There is no moral condemnation of the disruption. There are no steps being taken against the disrupters. COLMES: What steps would you like taken? Now some of the things they're saying, I agree, are reprehensible, but do they have the right to say those things under our Constitution and in our society? PIPES: I would certainly say if you do this, if you're a student, if you do this again, even now we've got problems. We're not going to accept this kind of behavior. And if you're not a student, you know, don't trespass on this university and don't come back. This has to be indicated. The university administration has to indicate this is not acceptable behavior. COLMES: Should they be expelled if they're students? Should they be thrown out? Thrown out of school for that? PIPES: Not the first time. But maybe the second time. I mean, I haven't thought through in detail the way this should work, but clearly some kind of moral approbation, sorry, some moral condemnation needs to be expressed here. In fact, again, we're getting moral approbation. COLMES: The fact is, this liberal university did get a chance to hear your presentation, albeit with a disruption. You said what you had to say. There was a respectful Q & A, and your voice was heard on this campus. PIPES: There was a respectful Q & A only because the disrupters had to leave. The university administrators made it clear they had to leave. So all the people who were going to disrupt did disrupt and left. And then it became respectful. PIPES: No a way to do business, is it? COLMES: We thank you very much for being with us tonight.